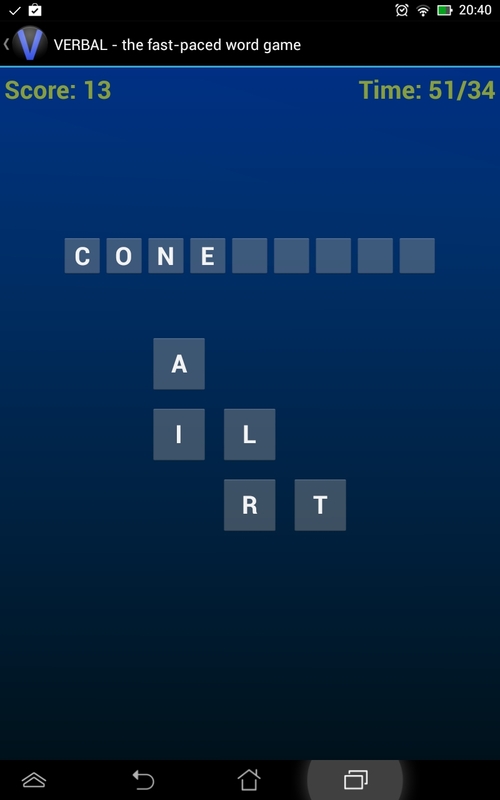 Verbal is a fast-paced word game where you must use your brains and your vocabulary. The game features two mind-bending play modes: Race the Clock and Solve the Puzzle. 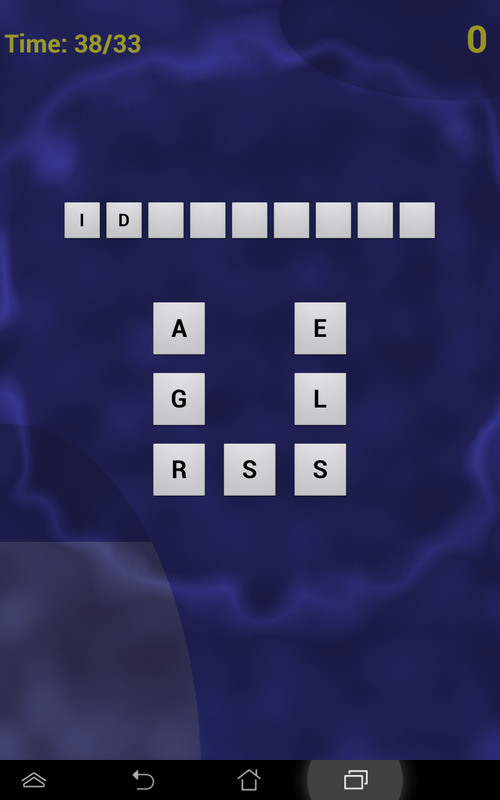 Find as many words as you can before the clock runs out! Bigger words get more score and give you extra time. Bonus letters: As your score goes up, some letters start to glow yellow - these are bonus letters. Play a bonus letter to double your score, or save up the bonus letters for even bigger bonuses. 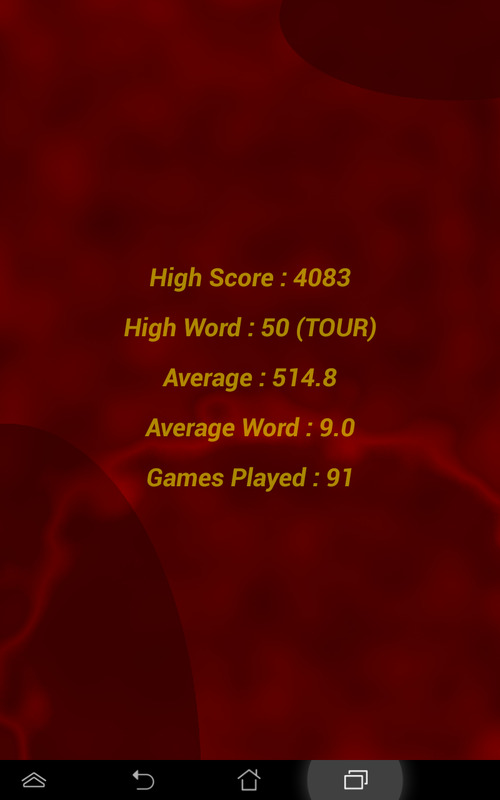 A word with two bonus letters gets 5x score, 3 bonus letters get 10x score. Combo words: If you make a word and immediately make a longer word from the same word, you score a combo word bonus. For example, if you form TOAST and then TOASTER and then TOASTERS, each of the longer words gets a combo word bonus. Find the nine letter word hidden in the scrambled letters. 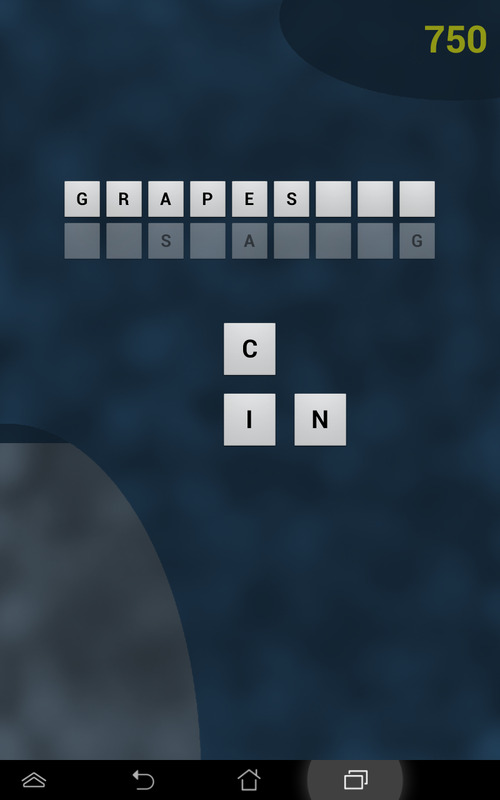 Play 5, 6, 7 and 8 letter words to reveal letters of the hidden word. Play wisely - each letter you reveal costs you a little score... But if you reveal the letter with an 8-letter word it costs less than if you only made a 5-letter word. Tap the letters in the letter pad to add them to your word. Tap the letters in the word bar to return them to the letter pad. All letters after the letter you tapped are returned, so you can use this to form new words quickly. For example, if you form FLOWS and then tap the S, FLOW will remain in the word bar. Then you can go on to form FLOWERS or FLOWED. To clear the word bar, tap the first letter in the word bar, or shake your device. Hi, this is looking excellent - I think with just a bit more interesting gameplay it could be a real winner. Everyone loves word games, not just "gamers" - it's a huge audience if you nail it. Definitely worth developing it some more, unless you're really sick of it by now! Does it come with instructions? I played without reading the above post fully and was a bit baffled to start with. Only just realized you can clear the word bar with one tap! That was my biggest irritation. What are the letter scores? Is it the same as scrabble? What determines whether a word gives more time? The letters in the word bar are quite small to tap accurately, at least for me with sausage fingers I guess it has to fit 9 across, but maybe they don't need any spaces between? Did you try doing it in landscape instead of portrait orientation? There seems to be room for the 3x3 rack either way round. The time left might be better as a bar, or maybe a ticking clockface like Countdown. Reason: you're concentrating on the letters, so flicking eyes up quickly to check the time is awkward, not to mention you have to switch your mind from "letters" mode to "numbers" mode to read the time. Well however you did it it seems to work really well and certainly fast enough on my phone! Also what impressed me is that there seems to be some kind of algorithm that always gives a reasonably "friendly" rack of letters with some possibilities. How did you do that? Almost feels there might be a 9-letter word in there every time - don't know if that's true or not? Maybe the friendly letters algorithm could be made a bit less friendly for a "hard" skill level? For me it could do with just a little something to keep the game driving on - it's called "the fast-paced word game" after all. Right now it lasts a couple of minutes per game (for me), but the second half not much happens because I'm out of ideas. If there was something where you could swap letters, like maybe a 30 second penalty to get a whole new rack, that could make it so a game could keep going for much longer. The bonus letter thing is great but IMO they don't come up nearly often enough. I want more dings and whoops! Thanks for the thoughtful feedback. I will be adding some popup help to the game as it does seem to confuse people. I have also found I've been high and dry at 90 seconds with no ideas, so it might be a very good idea to buy letters with time. I also have an idea for a no time limit puzzle mode. 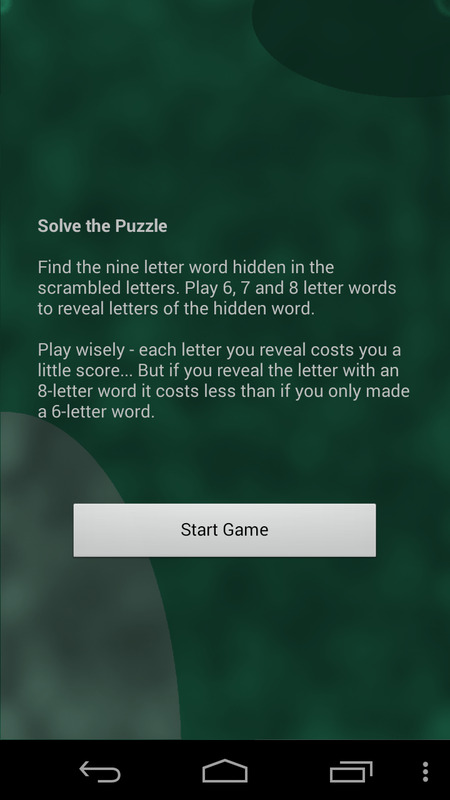 I used the trie to generate the puzzles in my IDE, not at runtime, there are 4k puzzles baked into the game, all with a nine letter solution and at least 450 words. Changing to portrait mode might be a good idea, or at least allowing both orientations. It's not an issue on my 7” tablet, but on my phone it is a bit fiddly and it affects the scores. What's your high score? My best effort on my phone was around 1000. Oh by the way, the original design for the game had a thermometer on the side to show the time. I might add a shuffle letters on shake function down the line. Just thinking a bit more about the little letters in the word area. There could be a big "backspace" button to back up 1 letter as an alternative. I'm having a bit of trouble killing the activity on Back. Still learning my way around Android. I've rethought the screen layout and the next version will have bigger word bar letters and I will finally implement the timer thermometer. ...also, I think I will add an Easy mode where bonus letters comne along more frequently. Was hoping to give this a try, but I don't have any Android devices. Is there a .jar version that can be downloaded? I've been working on the eye candy... I have a new visual time bar in the lower left and new smokey ripples. I like the smoke rings. The other effect looks pretty subtle from the screen shot, but is probably a lot easier to see with animation. Moving things tend to catch the eye. You've given me an idea - when the time runs out, the game will show the nine-letter solution (or one of them, many puzzles have multiple solutions). The other thing to add is richierich's idea to buy new letters with time. I also still have to tweak the contrast on the time bar and the score area. I can't run the app because I only have Java desktop. Are the ripples animated? That would be quite cool, I imagine. You wrote on another post about means of animation that were less cpu-intensive than Perlin's, so I'm wondering if this is one of those cases. If the word had been glissando, I bet I would have found it! I had to look up glissade to find out what glissader meant. I should have used LibGDX, than I would have a Windows version. But I'm writing the thing directly on my tablet and I'm using the basic Android APIs. It seems since I've started writing apps, everyone has an iphone. The smoke rings are animated, and shoot out occasionally from button presses. They are just a geometrical circle with a bell-curve intensity around the radius, where the radius size is multiplied by the mottled background. The background is just a texture (blue channel for the mottles, red to mask the darker shaded areas). This weekend I'll put version 2 on Google Play. I just have to redo a dozen layout XMLs first. Version 2.01 is now on Google Play - this version incorporates better graphics, more exciting gameplay and more intuitive controls. Find the nine letter word hidden in the scrambled letters. Play 6, 7 and 8 letter words to reveal letters of the hidden word. Play wisely - each letter you reveal costs you a little score... But if you reveal the letter with an 8-letter word it costs less than if you only made a 6-letter word. How do I get this moved to Showcase? Help pops up the first two times you play a game. If I can get some 10" tablet screen captures, I can get my app classified as Designed for Tablets on Google Play... Can anyone with a big android tablet help me out? I had to put out version 3.11 to make puzzles a bit easier. Previously, you could either solve a puzzle with a good score or fail with a zero score. Now it is possible to solve the puzzle with a lower score, so it is opened up to younger/less skilled players and it is less frustrating (hopefully). Still playing this a bit. The puzzle mode seems hard to me because most of the time I've never heard of the 9 letter word, even with the clue letters! Clearly I need to hit the dictionary, but I wonder how many people, especially younger players, would know any of the typical run of 15 solutions I called up as I type this post. In beat-the-clock mode it doesn't matter so much because you don't actually *need* the 9 letter word. I agree that many of the 9-letter words listed by @richierich are on the obscure side, but as they are more of a bonus than a main feature, they don't need to be as accessible or easy as the basic game play. Also, a lot of those words are perfectly reasonable. For example, I've seen "theropods" in Calvin & Hobbes cartoons. * In Scrabble, 7-letters is a threshold for bonus points. * In Boggle, 8-letters or more yield the highest per-word score (11 pts, vs 5 points for 7-letter words). * There is a Sunday puzzle feature (related to the Scrabble brand, I think) that features 5 or 6 7-letter collections to descramble and form into the highest Scrabble score possible. So, 9 is unique, AFAIK. That can be good (branding), but it can also be risky (unproven). Look for work-frequency charts, "easier" words will tend to appear more frequently than obscure words. Look for word lists or vocabulary lists geared for ESL or grade school levels. They have a puzzle in the Times every day called "Polygon" which varies in numbers of letters (7-10 or thereabouts) and is more like "beat the clock" mode of Verbal. But there's always a unique word using all the letters. No idea how they decide the words - maybe some person just chooses them by eye - not too difficult if it's just one a day I guess! Probably run an automatic uniqueness check as well - don't know if Verbal does that? I have 4000 puzzles to filter into Easy for the find-the-word mode. ESL-type word lists don't really help as we need to match the word form exactly. I think the manual approach is least hours of effort (given that time has to be spent researching and programming the alternatives). I will write a command line tool which shows me one word at a time and I will hit 1 for easy, 2 for maybe, and 3 for hard. Doing one word every two seconds will take 8000 seconds or two hours. Proper programming the solution would take much longer, and would yield lower quality. I find I play puzzle mode mostly now. It is exactly the right length to play while waiting for the metro or the kettle. Verbal allows more than one 9-letter word per set of letters. Puzzles with more than one solution are surprisingly common. This is fine for beat-the-clock mode but it is a bit of a problem for solve-the-puzzle!  At the moment, finding the "wrong" solution only unlocks a couple of free clues. I have started work on this again. My main goal is to make the game experience smoother with no random lags and glitches, which I now understand to be due to my overuse of AsynchTasks. I also have plans for three new game modes, Heavy Hitter, Sausage Factory and Wordtris. I now have an Android Emulator working. Am still new with Android stuff, and don't have a phone or tablet yet. Do you know if it is possible to run your game on the emulator? Any instructions for how to do so? I'm running the emulator via Android Studio on Linux PC. I just tried the obvious thing: fired up the browser on the emulator and navigated to Verbal in the game store! Unfortunately, it seems that Google doesn't want emulator customers. There is no "Google Play App" on the emulator device. There do appear to be ways to get around this, but I'm not sure I want to take that route (if it is indeed a copyright issue). Genymotion and something called Xamarin both look like they both provide emulators and a legitimate, working Google Play Store app for them. I'm guessing the only other way I could run your game would be to release a project source file of some sort. I still learning about all this stuff and am I don't know if there is a way to do that while not revealing source code (as one can with a Java jar file). Also I'm not clear if project source files come in a single format--i.e., Android Studio project seems to be structured differently from an Eclipse project. Surely someone else will know this? "Verbal" has one drawback as a game name: when I did a search at the Google Store, there were a LOT of hits. I had to pass through something like a dozen screens before spotting your game. Maybe (for future projects) it makes sense to come up with a unique name. If you ever do decide to try getting an emulator working, I'd be happy to help trouble shoot. I've personally encountered and solved a couple dozen gotcha's in the process of solving it for my PC. But there are always new issues arising, and Android dev really does seem to be a moving target.